Being a regular blogger makes it difficult to find topics that I haven’t already touched for weekly challenges. This week’s theme for the 52 Ancestors challenge is Military. So far, I haven’t found many ancestors who were in the military who I haven’t already expounded upon already. As I’ve recently found new information on Felicianno de Mello, I thought I’d write about him. I have written about him before. I covered his military record in 2010 and in an earlier post about why I had difficulties locating his records. Felicianno was born 19th of April 1807 in a village called Maia. 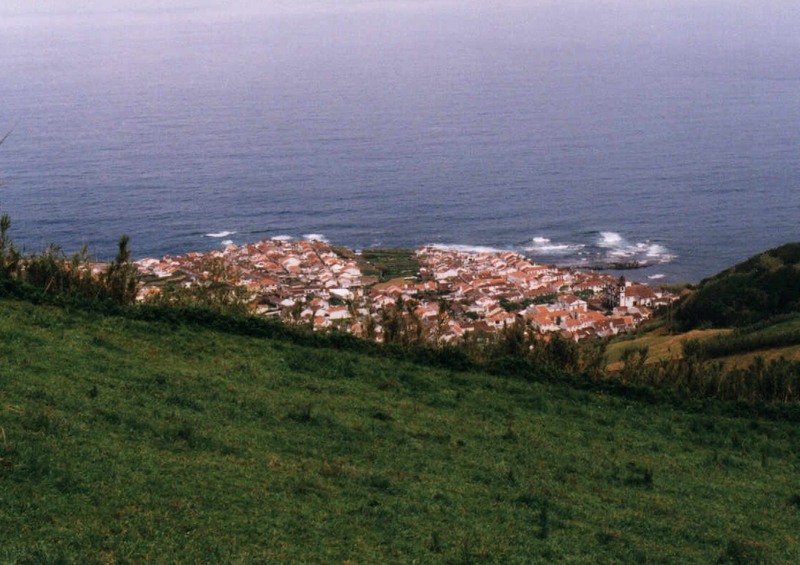 You will find Maia in Ribeira Grande on the island of Sao Miguel. He was the fourth son of Joao de Mello and Maria Theresa de Medeiros. Remarkably, all of the 8 children that I found for this couple made it to adulthood. This is what his village looks like today. The Azores were ruled by Portugal. Conscription was the law and Young men were drafted for the Portuguese military. I have heard stories of men who left on whaling ships rather than serve. I have seen the terms Alferes and other military ranks in the records, but none of them connect to me unless we go back to the 1400 and 1500s. I had a heck of a time finding Felicianno in the records. Following his siblings, I found all their marriages and the baptismals of their children. But, no Felicianno. Where was he? It wasn’t until I came across a baptismal record where Felicianno was the godfather. It was the first reference to his occupation “soldado”. Soldado is the term used for a soldier. It stated that he was with the battalion on the island. No wonder he married some 10 years after his siblings who were around his age! He had been away for a few years. He was most likely in the military from about 1823 to at least 1837. 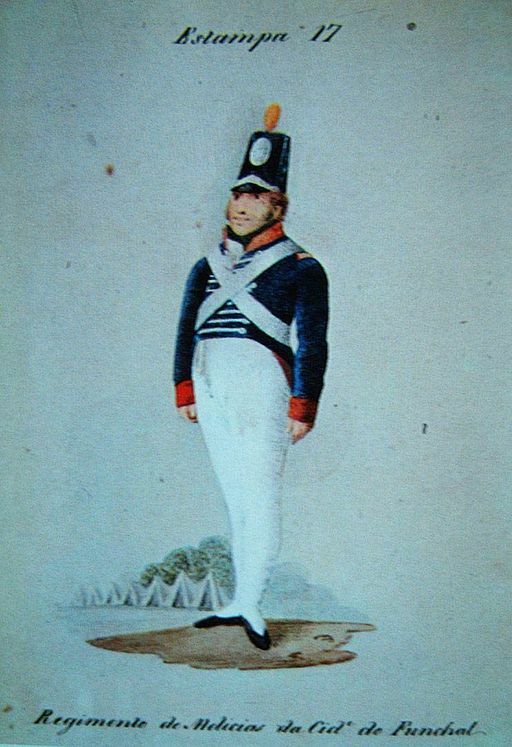 I found this image of a soldier from 1817, Funchal, Madeira. It was the closest to this period that I could find. I wonder if Felicianno wore a similar uniform? Felicianno married Rosa Jacintha Boteilho on the 26th of October 1840. They raised their family in Maia. Unfortunately, one tragedy after another befell their children. My research shows that only 3 of their 11 children made it passed the age of 10. Only two lived long enough to marry and start their own families. I covered this tragedy for the 52 Ancestor’s challenge in the post “Rosa was One Tough Woman”. Felicianno outlived his wife and 9 of his 11 children. He died at the age of 77 on 25 Apr 1884. His obito (death record) confirms he was a soldie,r “veterano na tropsa” = veteran of the troops. I have been through the records of Maia, Achada, Fenais da Vera Cruz, and Estrella. Felicianno is the only person to have this notation in his death record. I wonder why that is considering conscription was mandatory? It doesn’t appear that any of his brothers or cousins served. I hope that some day the military records of the Azores will become available. I would love to know the details of his service. Was he drafted or did he enlist? Where was he stationed? Was he involved in any battles or was his service more mundane? What role did he serve?